They say the Philippines has the longest Christmas season. That’s true. As soon as September starts, you will also start hearing Christmas songs on the radio and in malls. By the time the calendar hits November, Christmas trees and lights are everywhere, each mall and city giving something to boast about. Fine, budgeting during the holidays can be challenging. Almost everything is on sale and there are tons of items available that make you want to buy them even if you’re don’t really need them. You justify it with the “Pasko naman” excuse until you realize that by next year, you have nothing left in your pocket. What you can do is to set a Christmas budget and make sure you stick to it. You can even assign a specific amount per person to help you keep track of how much money you have and eventually, how much money is left. This way, you won’t be able to use all of the money you have. You might justify your spending because it’s Christmas season. Still, don’t use this as an excuse to buy everything you want for your family and spend all of your Christmas bonus on material things, especially if you are going home. .
Keep in mind that the OFW life is uncertain. Stick to your Christmas budget and immediately set aside a portion for your savings or emergency fund. You’ll never know what will happen. Gift-giving will always be part of Christmas. In fact, the celebration will never be complete without gifts under the tree. Kids are surely looking forward to opening their presents as well. What if you are on tight budget? In that case. don’t borrow money just to appease your family. There are legitimate and acceptable reasons why borrowing money is advisable – and buying gifts is NOT one of them. Keep things simple and explain ti your family why you cannot give all of their demands. Be honest about your financial status. There’s nothing wrong with giving gifts. It is and will always be part of Christmas. Still, take it easy on your spending. Your generosity is fine, but make sure that you will still have something left by the time the year ends. Again, go back to your Christmas budget. Set a certain amount for each person and try your best to stick to it. At the end of the day, it’s the thought that counts. The year may be ending soon, but this doesn’t mean your wallet should be empty. Take note and avoid these four holiday mistakes and you might be surprised with how much money is left by the time Christmas is done. 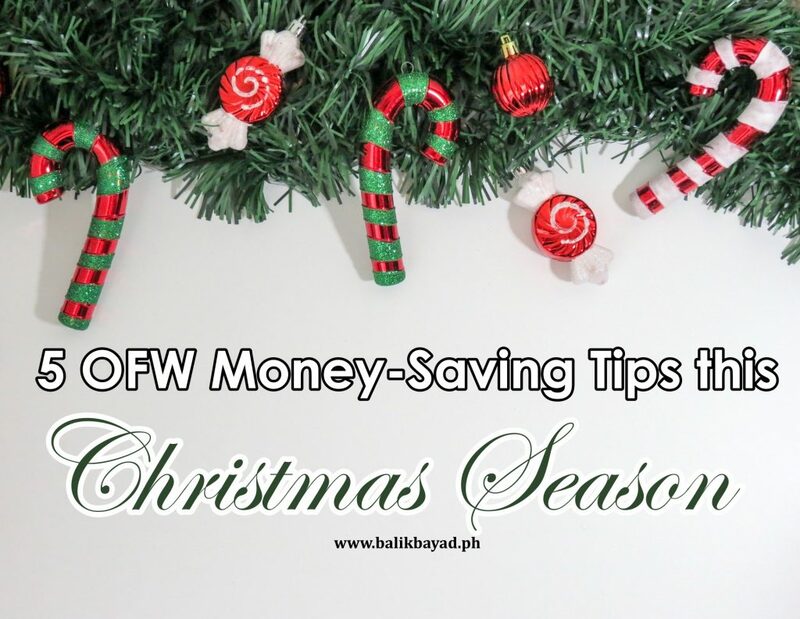 Previously, we shared five money-saving techniques during the Christmas season. Apparently, that’s not enough to make sure that you still have something left on your wallet by the time you get back to the country where you’re working. Tip No. 1: Consider re-gifting the items you did not use. Surely, you have mugs, tumblers, shirts, or other unopened items inside your cabinet, which you got from other people. Why not put them into good use and give them to your friends or colleagues who can use these items? This will help you save money and at the same time, free some space inside your cabinet. Just make sure that the items you will re-gift will fit the personality of the receiver and as good as new. Tip No. 2: Don’t settle for the usual gift wrapper. Buying a gift wrapper means costs. Sadly, the wrapper you paid for will be ripped and torn into pieces. Save yourself some cash and use magazines or newspapers as your gift wrapper. If you have unused paper bags, go ahead and use them as well. If you want to be creative, doodle on the Manila paper and use it as a gift wrapper, too. This will help you save more cash in the long run. Tip No. 3: Always give practical gifts. It’s the thought that counts, so they say. When giving gifts, make sure you go for something that the receiver will not just appreciate but also use and benefit from it. Don’t settle for the generics like shirt and mugs just for the sake of giving something to someone. Keep it simple and practical, yet useful. Tip No. 4: Look at the price tag. One of the reasons why people get broke is because they just buy whatever they see without any regard to the price of the item. Don’t be like them. Surely, you want to keep your family happy but buying an item that is way beyond your budget is not advisable. Make it a habit to check the price tag to help you keep track of how much you are already spending. Always be conscious of your spending to be able to save more during the season. Tip No. 5: Make Christmas get-togethers affordable. Not all OFWs can go home during the Christmas season. If you are one of them, then that’s okay since you can still celebrate Christmas with fellow OFWs. In that case, keep your celebration simple and affordable. Assign a place, preferably somewhere you don’t have to pay for rental fee, and have a potluck instead of getting a caterer. Have a videoke night or play games to keep it fun and enjoyable without hurting your budget. Tip No. 6: Try DIY in gift-giving. Are you good at crafts? Now is the best time to bring out your creative side and give gifts using your own hands. It allows you to save more money and at the same time, makes gifts more personal. Who knows, this could be a good stepping stone for a business. Word of mouth is a powerful tool, so make sure you put some effort into your gifts. Why do you want to work abroad? For many people, it’s the idea of earning in dollars and being able to provide a better life for the family. Despite that, there are still instances when it seems like your monthly income is not enough to cover your family’s daily needs. Plus, you want to open a new business so you don’t have to work overseas again. In that case, you can turn to OFW Loan for help. This type of loan is a financial assistance specifically catered to Overseas Filipino Workers. OFW Loan can be a personal loan, auto loan, or even a housing loan, but with special terms and conditions that will suit the needs and only applicable to OFWs and their families. Workers who are currently working abroad and with active employment contract. Balik Manggagawa, or workers who previously worked abroad and planning to go back but have no specific funds. Unfortunately, ex-OFWs or those with no existing Overseas Employment Contract (OEC) ware not qualified to apply for any type of OFW Loan since OEC is among the requirements. Still, you can avail of the ordinary type of loan from lenders depending on your specific needs. What are the allowable reasons to avail of OFW Loan? There are many reasons why you need to apply for a loan. Nonetheless, banks and private lenders are careful when it comes to the purpose. They won’t allow “to buy a new phone” or “for shopping” as your reason to borrow money. What are the requirements when applying for an OFW Loan? Borrower must be between 21 to 65 years of age at the time of loan application. This gives lenders a peace of mind that the loan will be repaid because you are still capable of working. Working overseas for at least two years, thereby proving a stable source of income. Monthly loan repayment must be at least 50 percent of the income. Having a co-borrower, which gives lenders a peace of mind that when something happens, the loan will still be repaid. Proof of employment such as payslip or employment contract as validated by the Philippine Embassy or Consul. Special Power of Attorney (SPA) if the application will be processed by a representative in your behalf. Are you ready to apply for a loan? In that case, Balikbayad is here to help. Submit your loan application now and we’ll get back to you as soon as can. Being an OFW can be exciting. The fact that you are earning in dollars makes you more capable of not just buying everything your family wants but also providing them a better life. You are also closer to temptations since you have access to brands that are not normally found in the Philippines. Always save before you spend. Is there anything more basic than this? It is never okay to put savings towards the end of your priority list. In fact, you should automatically set aside a portion of your monthly income for savings and this should also be included in your monthly budget, regardless of how much you are earning. Keep in mind that the OFW life is uncertain. If you prioritize your family’s bilin instead of saving what you can, you might end up going home with nothing but an empty pocket – and you don’t want that to happen. It is tempting to buy the items you see in stores and have it shipped back home. Your family will surely love it. But before you go straight to the cashier to pay the items, ask yourself this question: do they really need it? It sounds like a simple concept, but this is often forgotten by many. You have the tendency to fill your balikbayan box with items that your family don’t really need (like 10 cans each for spam and corned beef). Buy only things that matter. If you want to save more, don’t pressure yourself to send them a box frequently. You heard this countless times, “The earlier you save, the bigger the return will be.” That’s true. This is why you should never procrastinate when it comes to saving and investing your money. Read, explore your options, and educate yourself about the best investment choices for you. Ask around if it helps to give you an idea how different types of investment work. Remember that now is the perfect time to grow your money while you still can and you are able to work. Don’t wait for something bad to happen before you take action. Assets must be greater than your liabilities. First things first. Assets are useful and valuable things of economic value that bring you money such as income-earning property while liabilities are debts or obligations you owe someone like loans. Ideally, assets must be greater than your liabilities for a more secure financial future. This would also mean higher or positive net worth. It is important that you know the difference between the two so you will know how much you owe. You might be wondering why this is included as part of money principles. The answer is simple. When you are healthy, you are mobile and capable of doing things to be able to earn money. You cannot enjoy the value of saving and investing if you are sick. This is a common issue among OFWs. Most of you work 24/7 to be able to send big money to your family back home. When you do this and rarely get enough sleep and rest, your health is compromised. The next thing you know, you are using the money you earned from your sidelines in treating your illness. Relax,, take it easy, and get rest. Stick to one-day rest day and your health and body will thank you for it. Congratulations! After months of job seeking, you finally landed a job that allows you to earn in dollars. You attended and completed the trainings, submitted all the required documents including medical examination, and even sat down for one day to attend PDOS, which is compulsory, by the way. You need to secure your OEC or Overseas Employment Certificate. The OEC is a requirement imposed by POEA to make sure that all migrant workers are documented and protected. Also referred to as “exit pass,” OEC will be presented to international ports of exit in the Philippines to prove the legitimacy of your status as OFW. You will also need the OEC if you intend to take a vacation in the Philippines and go back to your country destination after your vacation leave. The OEC will likewise exempt you from paying travel tax and airport terminal fee. In the latest Department Order issued by Labor Secretary Silvestre Bello III, he declared that the issuance of OEC is suspended for 15 working days, both acceptance and processing of application. The reason behind such suspension? To cleanse POEA of corruption and to protect the people against illegal recruitment activities. DOLE recognized the presence of individuals and companies who are taking advantage of the increasing demand for workers abroad and the agency aims to put a stop on that. The Labor Department likewise found out that there are corrupt POEA employees who who issue OECs to illegal recruiters. During the duration of the suspension, there will be an investigating committee who will look into the root of the problem and submit appropriate recommendations. What is the effect of suspension? The suspension of issuance of OEC means approximately 75,000 Overseas Filipino Workers cannot be deployed – yet – since this “piece of paper” is an important document required to prove your status as an OFW. It will also take time, perhaps months, before they can get their OEC. Nonetheless, not all migrant workers are affected. Returnee OFWs, workers on leave (balik manggagawa), and those hired by international organizations, sea-based recruitment agencies, and diplomatic corps are exempted from this suspension. Don’t worry. The government is doing its best to normalize the situation and at the same time, put an end to illegal recruitment. Remittance is and will always be part of every OFW’s life. In fact, it is one of the penultimate reasons why you are working overseas since you want to provide a better life for your family. Many companies are offering remittance services since there are millions of migrant workers and the increasing demand for remittance services that will make transfer of money easier and more convenient. Cost – Every remittance company charges a specific fee when transferring money. Ask about the service fee first since some companies charge higher than the others. Convenience – Can you send money easily? Will your loved ones receive the money in a place accessible to them? Reliability – Is the transfer of money safe? Speed – Can your family get the money immediately or will it still take a few days before they can withdraw it? You know them as MoneyGram or Western Union among many others. In fact, this has been the go-to remittance centers of many OFWs because of speed and convenient service. It is impossible to miss them since traditional cash agents are conveniently situated to make money transfer easier for you. Your family can also get the money within minutes up to one day, depending on the type of money transfer. The issue with traditional money transfer operators is that they can be more expensive compared to other remittance channels. The quicker you want the transfer to be, the higher you have to pay for the service fee. For instance, Western Union charges $18 for cash pick-up, which will be available within minutes. If you opt for bank transfer, you will be charged $8, but the recipient will get the money after a day. On the other hand, MoneyGram will charge almost $20 for cash pick-up, which the recipient will receive in minutes. Nonetheless, traditional money transfer operators is ideal if any of the family member has no bank account, Paypal, or no access to the Internet. If you are looking for a secure and cost-effective way to send money back home, then banks are your best options. Major Philippine banks like BPI and BDO also have branches overseas to help facilitate bank transfers. The procedure is simple. Simply deposit the money at the bank and your recipient can easily withdraw it. Plus, you don’t have to worry about the cost since rates are fixed regardless of how much you send or the manner of receiving the money. Apparently, this will only work if you or any member in the family has a bank account. Otherwise, you won’t be able to enjoy the savings + remittance account rolled into one. Transfer cost is higher too, with BDO charging as much as $30 if you prefer door-to-door delivery. Check out the banks with remittance services here. You can’t physically go to cash transfer operators or banks to send money in the Philippines all the time due to time constraints. In that case, you might want to avail of online money transfer services for ease and convenience. All you need is you create an account, transfer money online, and your family can receive the money on the same day. Transfer cost is cheaper as well, with Xoom charging as low as $4.99 with your recipient receiving the money on the same day. Cash pick-up is available, but if you prefer more security, bank transfer service is also offered. The issue with this type of remittance option is the security risk. Online fraud and malware attacks are rampant these days, which is why security measures are employed to minimize the risk. There is no perfect remittance center since all three channels have their respective pros and cons. The best way to find out is to try each channel available while taking into consideration the fees charged. Consequently, don’t be afraid to ask about the fees. You want to send as much money as you can to your family back home and surely, spending a big chunk of money on costs is not part of the plan. Pasko na naman! Surely, your family back home has a long list of bilin – and they are expecting to see every single item inside the balikbayan box. After all, you only go home once a year, so you want to make sure that every member of the family is happy. Apparently, Christmas season means more spending than saving. Since you are earning in dollars, your family and friends are expecting you to be extra generous during the holiday. 1) Set a Christmas budget. and make sure you stick to it! This is the first thing you need to do even before the festivities start. Christmas season means eating out, shopping, preparing for Noche Buena, going out with the family, gift-giving, and the list goes on. It is tempting to use your bonus, especially since you got yours in dollars. If you don’t set a budget, you might end up going back to the country where you’re working with no money at all. Don’t live the millionaire life and budget everything. Having a budget encourages you to spend within your means and avoid going overboard. Try the envelope system and place a particular amount for every expense. This way, you still have something left as you head back to your normal routine. 2) Make a Christmas list. Aside from setting a budget, making a list is also important during this season. List down the people you plan to give gifts to and the gift you plan to give. This way, you can easily keep track of your spending and at the same time, make sure that you won’t miss someone who really matters to you. Remember: you don’t have to give gifts to everyone you know. Choose those who are closest to you. Be practical. 3) It’s okay to say no. Your kids want this and that, and to make up for the time lost, you gave in to their demands and buy everything they want. Apparently, that’s not a wise thing to do, especially if you want to be financially secure. The best way to handle this is to impose a one-gift policy. Let your family choose what they want for Christmas and check if it is within the budget. Explain the need to budget your spending as well since you will never know what could happen in the future. Hey, this includes relatives and friends as well. 4) Stay away from freebies. Christmas sales and freebies are rampant this holiday season. Surely, you are excited to buy something for every member of the family, which you can’t buy in the Philippines. Relax, take a deep breath, and never buy anything based on the discount or freebie available. Nothing is for free and you will always have to pay for something one way or another. Go back to your list and stick to what you can afford. Does your employer give Christmas bonus? Don’t get too excited yet. If you really want to prioritize saving even during Christmas season, then you need to be wise on how to use your bonus. You can get a few dollars from it, but the rest must be kept for emergency purposes. Use the additional money to pay off existing debts (a must! ), start an Emergency or Retirement fund in case you still don’t have one, or even invest it in products like Mutual Fund or stocks. You can even deposit a part of your bonus in your savings account to increase your money. We still want you to enjoy the holidays, but this doesn’t mean spending everything you have up to the last centavo. Remember that Christmas is about family and togetherness, and that’s what matters more than anything in the world. Should OFWs Pay Income Tax in the Philippines? They say the government’s taxing power starts from the moment you were born up until you die (and beyond). That’s true. After all, the citizens of a particular country are required to contribute proportionate amounts so that the government can provide necessary services to its citizens to improve the quality of life. What if you are working overseas? Are you still required to pay income tax in the Philippines? First, who is an Overseas Filipino Worker? OFW is a Filipino citizen employed outside the Philippines where physical presence is required to be able to perform work in the country of deployment. Take note that your foreign employer pays your wages, salaries, and other benefits, and not the agency who facilitated your deployment. You must be registered with the POEA to be an officially recognized OFW. Nonetheless, your basic rights as a Filipino citizen remains even if you are working abroad. What’s the rule on OFW’s salaries? Under the Philippine Tax Code, all Filipinos will be taxed based on the income derived within and outside the Philippines. This means wherever you go, everything you earned is taxable because you are a Filipino citizen. Don’t panic yet. There is a principle called Tax Reciprocity which exempts you from paying income tax in the Philippines. Under the Tax Reciprocity rule, Filipinos working abroad are exempt from paying taxes in the Philippines since your income is already being taxed in the country where you are working. Similarly, foreign individuals working in the Philippines will no longer have to pay for taxes in their home country since they are already paying taxes here. Documentary stamp tax imposed on remittances. To avail of DST tax exemption, the OFW must submit Overseas Employment Certificate (OEC), valid membership certificate from OWWA, and electronic receipt issued by the POEA prior to remittance transaction. Does this mean Overseas Filipino Workers will no longer pay taxes in the Philippines? That depends. For income alone, you don’t need to file an income tax return. BUT if you are receiving income from sources within the Philippines, then those income sources are subject to income tax and must be paid to avoid tax evasion case filed against you. Still, it is hard to escape the government’s taxing power. Wherever you go, whatever you do, the government will always find a way to impose tax on you. Nothing is certain, especially if you are an OFW. One day, you’re earning in dollars and living the life of a millionaire and the next day, you’re back home because you were among those workers who were retrenched. This is why it is imperative that you invest your money to make it grow. Mutual fund is a type of investment fund that collectively pools money from various investors, both individual and corporate. This pooled money will be managed by a professional fund manager, who will then invest the fund in stocks, money market instruments, bonds, and other forms of securities. The value of each share of the mutual fund is called Net Asset Value or NAV. It is computed daily based on the total asset value of the fund divided by total number of outstanding shares of the fund. If NAV is increasing, then that means you are earning. Stock or Equity Fund – This type of mutual fund is invested in stocks listed in the Philippine Stock Exchange. Among all types of mutual fund, stock or equity fund yields the highest returns. Apparently, this type comes with highest risk as well. Bonds Fund – This type of mutual fund is invested in fixed income securities like government securities (T-bills, treasury notes, bonds) issued by the government or commercial papers (LTNCD, corporate bonds) issued by Philippine companies. Possibility of loss is lower compared to stocks because bonds are usually guaranteed. Balanced Fund – This is a mixture of equity and bonds fund, thereby creating “balance” between high-growth-high-risk investment and conservative growth of fixed income securities. If you want to be on the “safe side,” this is highly recommended. Money Market Fund – This is the same as Bonds Fund because the pooled money is invested in fixed income securities. Unlike Bonds, money market fund is good for one year or less. Identify your investment goal. Are you willing to take a risk to grow your money? Or do you prefer to stay on the safe side? It is important that you establish your investment goal first to help you decide what kind of mutual fund you will get. This way, you are more comfortable in putting money for investment. Know the risk you are willing to take. Are you a risk taker? Then stock or equity fund is your best option. If you are not willing to take a risk, then bonds are recommended. Otherwise, balanced fund is ideal if you prefer medium growth with medium risk. Explore and then choose. There are many banks and financial situations that offer mutual fund. Make sure to look into them first, compare what they have to offer, ask recommendations, and then decide who to give your money to. Trust your gut and find someone you can trust. Still, don’t limit yourself with mutual funds since this is just one of the many ways to make your money grow. In case you need extra funds to, say open up your own business, Balikbayad is here to help. Submit your application form online for pre-approval and we will get back to you as soon as we can.